The party headed back to the caves after a week, M spent the time researching his magic and crafting a scroll while the others rested and enjoyed the company of townsfolk in the Dead Witch Inn. They returned to the caves via the north entrance, this time encountering no resistance as they made their way south, towards the one area not yet fully explored – the stone warrior room. Arriving finally at the stone warrior room, the party found it quiet and undisturbed, the remnants of their prior battle with the stone warriors still scattered about the floor. The main room was a luxurious foyer with hearth, bearskin rug, unlit fireplace and two sconces on the wall providing (clearly magical) light. To the south, the party could see large double doors. Marton explored an open archway to the north, while Farfuleg explored a broken door to the east. Marton walked through the arch, into a small room with an empty dais of green marble on the north wall. He approached the dais and touched it with his sword, Garros and M watching from afar as he blinked out of existence! Meanwhile, Farfuleg entered the broken door into a room whose floor was cluttered with stone fragments, a battle-axe, and the remains of a long-dead adventurer next to a rotted leather backpack. Farfuleg prodded the backback with his sword, intent on opening it. As he did so, a cloud of yellow dust burst forth. He leapt back out of the room, just in time to avoid the dust. When it settled he approached again, this time avoiding the backpack but retrieving the battle-axe from the floor. 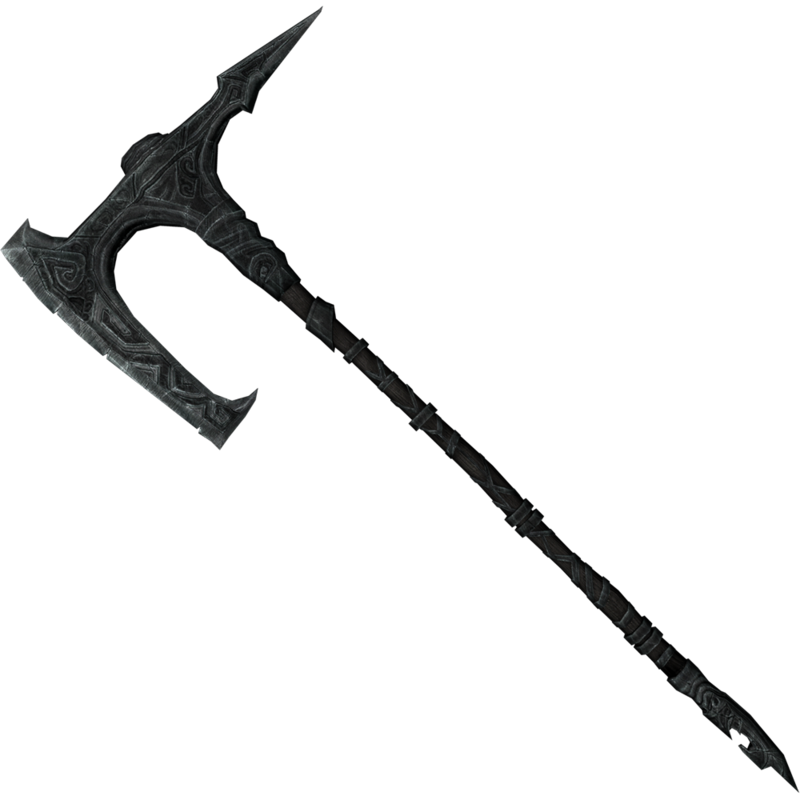 It was finely crafted, blue-tinged steel with runes carved on the shaft. They appeared to be Dwarven runes, but even Garros could not decipher them, thinking them some ancient form of Dwarvish. Before leaving, the party decided to investigate the double doors to the south. When Garros opened one of the doors, however, beyond was darkness not even he could see past – almost certainly magically enhanced. A bit of crafty exploring showed that the darkness extended 10 feet, beyond which were two more doors, leading outside. Two spiked pits were between the inner doors and this egress, one taken up by a large, decomposing creature. The party decided to leave the pits and return to find Marton, exploring the by now well-known southern reaches of the caves. Meanwhile, Marton found himself in darkness but at least on a stone floor, unharmed. He lit a torch and saw he was in a 20’x30′ room with a half-raised portcullis to the east and black bone shards covering the floor. He threw caution to the wind and started exploring alone, to the east. He made it through several rooms the party had previously explored without him, passing four dead giant toads and finally ending up in one of the large jail-cell rooms. He had been there but a minute when he heard shouts to the west and ran that way, back towards the portcullis room. While searching for Marton, Garros had run into two wandering flagstone spiders just outside of the portcullis room. He had no problem slaying them, but Marton heard the sounds of battle and appeared in the hallway several minutes later, just as Garros slew the last spider. Happy to be reunited, the party decided to head back to town and try their luck with the lower levels of the caves another day. On the way back to the north entrance, Garros was scouting ahead as normal when he rounded a corner and found himself face-to-face with a Dark Elf! Garros tried to engage the Elf in a parley, but the Elf saw through his offer of a map of the caves and attacked with a glowing sword! Garros drew his handaxe, now also glowing, a bright red. The rest of the party rushed to his aid, too late as the Elf enshrouded he and Garros in a globe of pitch darkness. Garros dove to the floor and rolled towards the Elf, but a lucky sword strike by the Elf hit home. By the time Garros and the others emerged from the globe of darkness, the Elf was gone, and Garros was badly wounded.